update 03/02/19 : welcome our little blog ! After you read the info below about the pre-filters on our Mini Lite, take a look at the other stuff we have written about. Along with our previous modification, where we added a water filter tap to the kitchen sink, it was time to improve the water before it gets into the trailer. 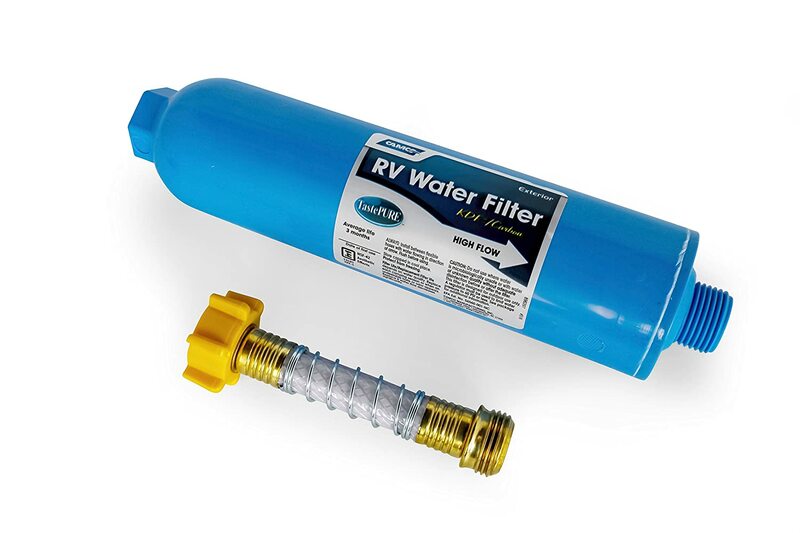 Like most RVers, we were recommended to get a filter to improve the quality of the water from a city water connection, or filling the holding tank. Generally this comes in the form of a Camco KDF / Carbon filter. Basically, this filters at 100 microns, which is VERY large in the grand scheme of water filters. Its essentially a sediment filter which can also trap some odor and chlorine flavors from the water source. Because its KDF, it is at least capable of inhibiting fungal and bacterial growth when not in use. This is handy for occasional campers like us. Because it has such a huge micron size, its at least a high-flow filter, but that said… its not really going to do much besides perhaps make the water taste slightly better. We used our Camco pre-filter religiously for a whole year, sort of assuming it was doing “something” because it was recommended by the RV dealer. The moral of this story : This filter is better than nothing, but also does next to nothing for your water purity. Think of it as basically the same as one of those PUR water pitchers that has the carbon filters to improve the taste of water from your kitchen sink. Also… pre-installed inside our Rockwood Mini Lite 2104S, was a Water Pur RCS / KW1 Water Filter. This filter was installed after the city water bypass, and after the water pump. According to Water Pur this filter is a 5 micron filter with a 2.5 gpm flow rate. We supply the KW1 for the sole use of Forest River, because they wanted a product that was better than the standard. Therefore, Forest River was the most obvious distributor. So to be fair, most folks aren’t usually looking for anything better than a water filter such as the WaterPur setup. Assuming its 5 microns, the WaterPur filter definitely is capable of filtering chlorine and sediment, and its a good add-on for Rockwood. However, I think further consideration should be made by their install choices and vendors to not only serve their customers better (there are a lot of newbie campers like me out there!) but to raise awareness of water systems and how you can better maintain and possibly improve your systems for long term use. So, this is a bummer for us because we generally prefer to Dry Camp (no city water pressure). This means that our little DC pump (which is actually a pretty good one… good job Rockwood !) has to pull water from the holding tank, then push it through a 5 micron filter. Luckily, its plumbed directly after the pump, so it doesn’t have far to go. However, as you might guess, this DOES reduce the overall water pressure in the trailer. And in our opinion, is NOT the best place for a filter to be installed. At least not for our usage. For folks who are only on a city water connection (at a campground or RV park) , the install location might be just fine, because there would be plenty of water pressure to push through the filter without really noticing. remove the KW1 filter, incase somehow that was causing no water to flow ? Because we removed the filter pretty early on in the game, we just never put it back in, because there was a noticeable water pressure drop with the cartridge in the housing. Problem 4 with the WaterPur filter : its permanently installed inline and has no bypass. This is a bummer because you cannot bypass the filter when winterizing the trailer. This is especially true if you use the normal Antifreeze method. Reason : you have to unscrew the housing to remove the cartridge so you dont have to pump all that antifreeze through your carbon filter. Is that so hard ? No, of course not, but the cartridge for us is in a very tight space (sharing a small compartment with the water pump). The housing is ALWAYS full of water naturally, so water spills all over the place when you have to remove the cartridge. For us anyways, if you dont REALLY crank down hard on the cartridge housing, it WILL leak. So it also is a pain to re-seal the housing both after removing the cartridge and when replacing. All Rockwood would have needed to do is put a simple bypass on the cartridge OR install it elsewhere in the system. So for us, it makes much more sense to filter the water BEFORE it gets inside our trailer, whether that be on city water or in our holding tank. Filter all incoming water to the rig (city, storage facility fill, water containers). Filter all water before it even hits our plumbing. Try our best to reduce sediment / solids and chemicals from the water prior to getting in our plumbing. When filling the holding tank, generally you have a high pressure (city water pressure) , so filtering on the way in doesn’t take that much longer than w/o filtering. the same is true for RV parks or Campsites with a water hookup (in fact, most folks have to reduce the pressure of the incoming water so they don’t damage the lower-pressure plumbing in their campers. After some considerable research and even scheming up some DIY options…. 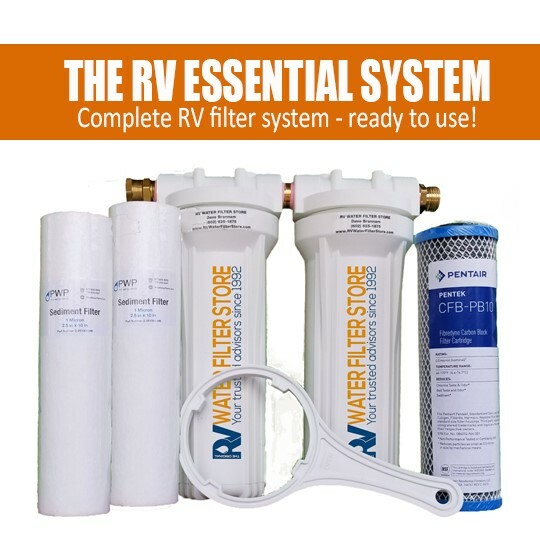 We chose the Essential System (step 1) filter from the RV Water Filter Store. This is a two stage cartridge system that can accept standard sized filters (any brand and type). Consequently, you could easily expand (or even just temporarily expand) to a 3 stage system by just adding another single canister. This might be needed in an area, for example, that has very high Iron, or extremely high sediment in the water. Its nice to have the flexibility. Stage 2 : Pentair CFB-PB10 which is a carbon filter that filters down to .5 microns. So, using this pre-filter every time we fill the water tank OR when connected to city pressure ensures that we are putting some very clean water into our system. For drinking water (coffee / tea / some cooking) we then have the ceramic filter that we have previously installed. The bracket and the fittings can all be purchased separately from RV Water Filter Store. So… since I had already purchased the bracket (I’m hoping to mount it to a stand at some point), I now needed the 3/4″ garden hose fittings. The above picture shows the pre-filter in action filling up the tank at our storage facility. Since I haven’t built a stand for it, its just sitting in the back of the truck, filtering the water from the storage place, before it gets into the camper. Purogene is used to control harmful bacteria growth in drinking water systems. Using the oxidizing power of chlorine dioxide (CIO2), Purogene eliminates bacteria and odors without coloring the taste of the water like other disinfection products such as chlorine. Hey that sounds pretty good right ? So, the idea is to use Purogene in a high concentration to shock sanitize the system (say once a year after being in storage for a long time) OR in a low concentration EACH TIME you fill the water system. For our tiny 43 gallon tank, that equates to about 1 and 1/3 ounce of Purogene on every full fill of our tank. The cap on the bottle is conveniently 1/3 of an ounce, making it easy to measure. We have tried this product on a few short trips, and so far, its working great and does indeed seem to have NO odor or taste. We are feeling more confident that the water in the holding tank is as reasonably sanitary as we can get it. We have also used Purogene after pre-filtering our water with our transfer pump when moving water from containers into the trailer. Naturally, its MUCH slower (but totally bearable) when using this method since we have to push the water through the 2 stage system, but this ensures we are putting good water into our trailer. Measuring the total capacity in our water containers (in the picture below, we had 29 gallons) we could then calculate the amount of Purogene to add into the holding tank during refill. a cold and wet first try with the transfer pump and filter set up for my lovely assistant. Here we are pulling water from water containers. Dave : If you are filling a tank with a gravity feed, you normally don’t need a pressure regulator. The flowing pressure is normally about 1/2 to 2/3 the static pressure, so you would need to be about 100 PSI to start to worry. Pressure regulators are most important for limiting static pressure in the lines. The only thing at risk at all would be the filter canisters, and it would have to be extremely high pressure to blow an o-ring with an open flow. I assume that for the 2 stage filter (step 1 : https://www.rvwaterfilterstore.com/STEP1.htm) if we arent using them for a few days, its best to drain them, leave open to air dry (so nothing can grow in there). We use these with garden hose connections when we gravity fill our camper / connect to city water. Dave : If you are leaving the camper in storage for more than a month, then you should dry out the essential filters. You can then put the dry cartridges back into the canister. So… thats about it for now. We have used this set up just a few times so far, but it sure seems to be working effectively. We have a longer journey coming up soon, hoping to perfect our setup and get a good solid routine in place to keep our systems and water as clean as possible. Any intention of installing the two stage cartridge system inside the trailer? And when is the Tank Pressurizer blog happening? hey there… yeah, I’d like to have the filters mounted inside the trailer for when we do our fills. Currently, we dont have any space available to do that. Our basement storage is pretty limited and/or taken up by the battery / solar / converter setup. Im hoping to build a storage box soon on the tongue, which will alleviate the storage issue. I hope to post the pressurizer stuff soon. Overall, it seemed to help stabilize the water pressure but did almost nothing for the pipe hammer noise.